"We have never before seen a star moving fast enough to completely escape the confines of our galaxy," said co-discoverer Warren Brown (CfA). "We're tempted to call it the outcast star because it was forcefully tossed from its home." The star, catalogued as SDSS J090745.0+24507, once had a companion star. However, a close pass by the supermassive black hole at the galaxy's center trapped the companion into orbit while the speedster was violently flung out. 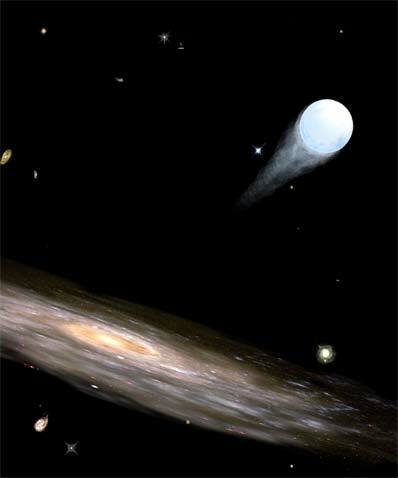 Astronomer Jack Hills proposed this scenario in 1998, and the discovery of the first expelled star seems to confirm it. "Only the powerful gravity of a very massive black hole could propel a star with enough force to exit our galaxy," explained Brown. While the star's speed offers one clue to its origin, its path offers another. By measuring its line-of-sight velocity, it suggests that the star is moving almost directly away from the galactic center. "It's like standing curbside watching a baseball fly out of the park," said Brown. Its composition and age provide additional proof of the star's history. The fastest star contains many elements heavier than hydrogen and helium, which astronomers collectively call metals. "Because this is a metal-rich star, we believe that it recently came from a star-forming region like that in the galactic center," said Brown. Less than 80 million years were needed for the star to reach its current location, which is consistent with its estimated age. The star is traveling twice as fast as galactic escape velocity, meaning that the Milky Way's gravity will not be able to hold onto it. Like a space probe launched from Earth, this star was launched from the galactic center onto a never-ending outward journey. It faces a lonely future as it leaves our galaxy, never to return. Brown's co-authors on the paper announcing this find are Margaret J. Geller, Scott J. Kenyon and Michael J. Kurtz (Smithsonian Astrophysical Observatory). This study will be published in an upcoming issue of The Astrophysical Journal.